Personally, I think the naihanchi shodan of Zenpo Shimabukuro is at its most interesting when it gets to the "double chudan/gedan block" (as per the adjacent image) - just before the uraken (backfist) is usually executed. It is here that Shimabukuro's version is truly unique in that it combines features from very distinct lineages. Of course, that's one way of looking at Shimabukuro's kata. Another is to ponder whether this "combination" actually reflects a more "ancestral" or "fundamental/original" nature of the version, complete with "embryonic" or "stem cell" movements capable of morphing into many of the various lineages we see today! Actually, the "double chudan/gedan block with uraken" sequence in this kata has long been a bug-bear of mine: I have lost count of the number of discussions I've had (in person, by correspondence and online!) regrading this sequence. Of course, all of these discussions have been quite fruitless. Why? Because there is simply so little historical and even technical data to allow for any firm conclusions. My own preference for this portion of the kata is to execute a "haiwan nagashi uke" and an "age ura zuki" (rising inverted fist). Until recently I thought this was only really done in Gichin Funakoshi's shotokan style - and even then, not in every modern variant of that style! I'd previously argued strenuously that this marvellous technique was far more useful than the "simpler" double chest/low deflection with a forward uraken (backfist). And I lamented the fact that this technique appeared to be largely "forgotten". So what is this "haiwan nagashi" technique? Briefly, it is the arm being raised as a kind of jodan/age uke that swings past the side of the head2 then powers through to rising inverted punch (rather than an backfist strike). So why do so few styles teach the haiwan nagashi uke with the age ura zuki? Well for starters, if you don't have the haiwan nagashi, you simply can't have the age ura zuki. You need the first to generate enough momentum for the second. 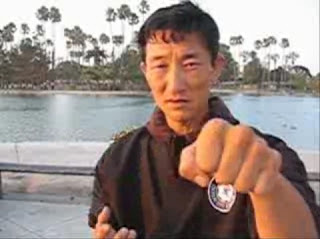 If you don't have that momentum, all that you have room for is a shomen uraken (forward backfist snap) (see how in the Choshin Chibana kata video in Part 1, he struggles to get enough momentum for even the uraken, never mind a rising inverted punch). While the uraken was, I think, always an option for the kata, I believe it was a secondary one. However if you remove the haiwan nagashi movement, the uraken becomes your only option – it's that simple! Personally I am not surprised that the haiwan nagashi hasn't survived in most modern versions of naihanchi. This old Chinese technique is easily misunderstood – particularly in its "stem cell" form as it occurs in Shimabukuro's (and Funakoshi's!) kata. In order to accommodate both it and the double chest/low deflection, the angle and use of the forearm needs to be altered slightly, creating what I consider a slightly awkward transition from one to the other (compared to, say, the more fluid method I demonstrate in the video above). Nonetheless it can be done; it is possible to accommodate both. But you need to know exactly what it is you're doing and why, or the tendency will always be to a kind of "entropy" – with the haiwan nagashi falling away. So will I be adding the double block and the uraken to my haiwan nagashi uke/ura zuki in my version of naihanchi? I doubt it. You see, we already have those moves in the kata seiunchin, so I don't see the need to squeeze them in to naihanchi for pedagogic/mnemonic reasons. To me, naihanchi/naifunchin presents a golden opportunity to practice the haiwan nagashi uke and age ura zuki (among other unique techniques!) instead. Zenpo Shimabukuro's naihanchi is also notable for what I consider its "proper" use of nami ashi – the returning wave kick. 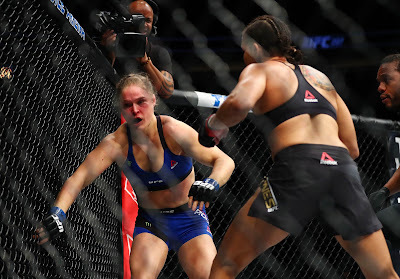 For a start, it should only be used preceding the augmented tetsui uchi (hammer fist strikes) – not on the cross steps! I'll discuss why I think this is a biomechanical error a bit later. 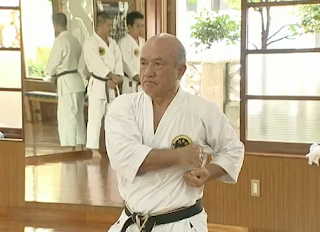 But for now it is worth noting that Shimabukuro, like Motobu and Funakoshi (and, I think, the majority of naihanchi practitioners), only uses them preceding those hammer fist techniques. The second point to note is that nami ashi is a very specific technique, one that relies upon your foot rising in front of your body. The sole of the foot should not simply slam into your thigh! Second, when striking your inner thigh, the technique isn't available as a rising deflection against groin attacks (see the adjacent image) - which is, in my view, one of the major distinguishing features of the technique as a "nami ashi" as opposed to "ashi barai" (ie. the former includes the latter, but the latter does not include the former). Whichever way it goes, it is worth noting that all the old masters show the foot coming in front of the body very clearly. This is true for Funakoshi, for Motobu – everyone. So it is no surprise that it should also be true of Shimabukuro's "ancestral" naihanchi kata! Note the nami ashi in this performance by a kyudokan student: the nami ashi clearly does not go in front of the supporting leg but audibly slaps into the thigh. Ditto with Michiko Onaga's performance under the "double hip" heading. I also applaud Shimabukuro for not including in his kata extra nami ashi during the steps across. If you're stepping across, your back leg is going to be delayed. Even simple leg lift requires you to pull it forward to your front. It is simply nowhere near the correct position to execute a nami ashi: it is too far away from the action. Put another way, whether you're using nami ashi as a defence (eg. deflection/block of a low attack) or as a sweep or any other offensive manner, you can only realistically do so if you are doing it off your front leg – or at least in a position where both legs are equally available (ie. he is standing right in front of you and you are standing feet apart with neither in prominence). However if you are stepping across in kosa dachi (cross stance) and your back leg needs to be dragged forward to do a nami ashi, this is really quite impossible to use. You might be able to think of something creative as an "application" (eg. step into place, then suddenly use a nami ashi) – but I submit that this is really different from a technique you would naturally choose to do. Essentially I think you're trying to fit a square peg into a round hole. In this context, why would people want to add nami ashi after each step? I think it is almost certainly the "ghost" of another, missing technique: the ashibo kake uke. It is my view that the extra "nami ashi" are really a "partial memory" of something that was done during the steps across. I believe this "something" was easily misunderstood or forgotten because it manifested as not much more than a "knee lift". Such "knee lifts" might have seemed quite incongruous to some, who would have thought it redundant and simply omitted it from their kata. Others would have reinterpreted the "knee lifts" so that they were converted to extra nami ashi. Fewer still would have retained this knee lift and seen its potential as a potent "ashi sabaki" method which I was taught to call ashibo kake uke or "shin hooking block". This knee lift is clearly visible in the kata performance of Gichin Funakoshi. I demonstrate the application of this "knee lift" below. It is particularly useful against a roundhouse/soccer-style kick. So who says these "leg raises" are even there to begin with? 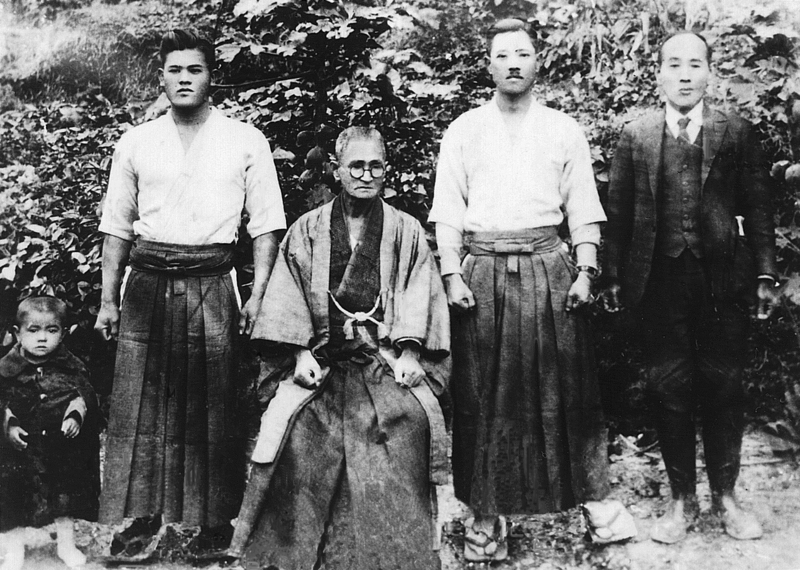 Well at least half of the naihanchi practitioners – from people like Funakoshi (as noted above) to all those who (I believe mistakenly) put in extra nami ashi instead of ashibo kake uke (Tatsuou Shimabuku, for example). Some martial arts schools fall somewhere in the middle, with their founder demonstrating the ashibo kake uke in movement, while their modern day students demonstrate a nami ashi. One example of this is the school of Shoshin Nagamine. Consider the adjacent images of Nagamine in the 1960s, taken from a film footage which can be found here. In this performance it is quite clear to me that the knee is being lifted in a circle - and not to create a nami ashi. Shoshin Nagamine's system today seems to feature extra nami ashi which have replaced "ashibo kake uke"
Another interesting feature of Shimabukuro's naihanchi is the chamber for the downward block (gedan uke) and double punch (the yoko and kagi zuki). In one variation, your bottom fist is palm up, while the upper fist is sitting on top with the tetsui (hammer edge) resting on your the "palm" of our bottom fist. This is how Gichin Funakoshi did his chamber. In the other variation, the fists rest on each other, palm over palm. This is how Choki Motobu did his chamber. I'm going to go out on a limb here and say that I think the former is the more original. I'm going to give a fair disclaimer however: it's the way I've always done it (probably via my JKA heritage). I'd say that the dominant way it is done by naihanchi practitioners around the world is Motobu's etc. way – ie. palm over palm. And truthfully, this allows some rotation of the forearm so that it can be used in the downward deflection. Consider the jodan/age uke for a moment: It connects with the flat edge of the two bones (radius and ulna), and only rotate safely through the "sharp edge" after impact. However the reverse would seem to be happening here. If we utilised the "forearm rotation" in the manner Motobu's position suggests, and apply it, say, against a low kick (and yes, I know it might also be a strike – I'll get to that!) it would require your forearm to contact with one bone first, and only then rotate around to the flat edge of the forearm. To me this is potentially catastrophic. 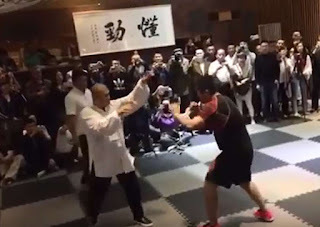 Low attacks, especially from kicks, carry a lot of momentum and there is simply no way one should be risking using a forearm to deflect a kick with anything less than both bones of one's forearm – even if one is using tenshin/taisabaki and even if one is using forearm rotation. 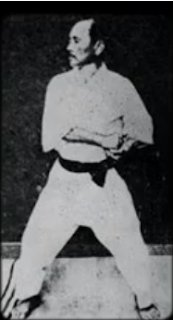 By contrast, the Funakoshi (and Shimabukuro) hand position naturally "slices" any incoming kick with the flat of the forearm using both radius and ulna. The rotation of the forearm isn't being used to create initial contact on a single forearm bone – nor should it! My applications of the lower "block" from naihanchi. Note my chamber with the hammer fist on top of the "palm" of the other fist". If you use the gedan movement as an "uchi" (strike) not as an "uke" (deflection/parry/block) then my feeling is the "hammer fist" position is still optimal. It is directly aligned for a strike to the groin. The extra bit of "torque" one gets from a "palm on palm" chamber is not only negligible – it is also arguably both unnecessary and inappropriate. If you doubt me, consider the gedan barai from gekisai kata (often used as a groin strike): that technique doesn't have any "torque" in the forearm and nor should it; the most direct route to the groin is by rotating the whole arm around the elbow and into the groin – without any rotation of the forearm on its axis being necessary or desirable. The gedan barai converted into a downward strike is effective – but it doesn't rely on any kind of wrist "torque". Instead it relies on a swing of the whole arm. 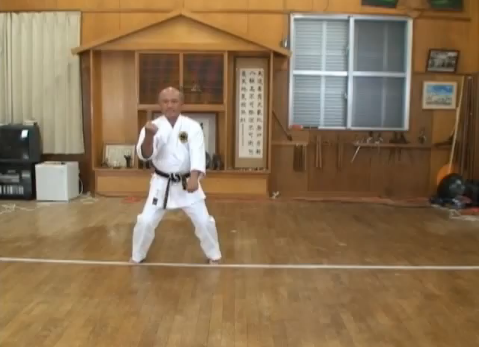 While this video is from gekisai kata, it illustrates the same sort of positioning. Where the chamber precedes the double punch, I note that Motobu's way completely removes all forearm "corkscrew" from the longer punch (yoko zuki) so that it becomes a mere sideways "swing". Funakoshi's chamber however allows the most natural corkscrew action possible in the circumstances. For all these reasons, I think it is clear that Shimabukuro, like Funakoshi, got the chamber "right"! The lack of "double hip"
What I really like about Shimabukuro's kata performance is that we see very strong hip use. Yes, it has just a small bit of loading at times. But here's the bit I like the best: any hip use falls well short of a dogmatic double hip. I've done that topic to death, so I won't bother covering the same ground again. I will note that none of the old-time performances shown here – not Chibana's, not Shimubukuro's not Shimabuku's, not Funakoshi's not Motobu's – none of the classical kata we can see have this "double hip". So even if you're an ardent fan of this method, I think you have to agree with me that the evidence is most supportive of the fact that, in relation to naihanchi, it is a modern innovation. Onaga Michiko's naihanchi. Note the extra hip loads before each movement. I can't see how this can be confused with any classical performances of naihanchi. Rather than reflect "ancient knowledge" it is clearly a modern "innovation". So is there such a thing as an "ancestral" naihanchi - and is it Zenpo Shimabukuro's version? The answer is almost certainly no to both questions. I suppose I titled the article this way because it is a tad more "sensationalist"! In the end, it is very unlikely that there ever was an "original" naihanchi. 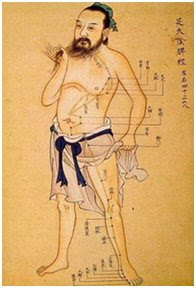 Itosu is said to have performed and taught it any number of different ways for different students. In undertaking any sort of analysis of a classical kata, we are forced to make certain assumptions, and speaking of an "ancestral form" is one of these. It is almost certainly flawed. But that doesn't mean it can't have its uses. We are forced to make any number of assumptions before we start examining the history and evolution of any classical kata. For example, other assumptions that we tend to make are that the designer/designers of the form were infallible in their technique. The truth is, they were people just like any other. So comparing ways of doing techniques and assuming that the "more logical" method is the "original" is fraught with potential error. But that doesn't stop us using this paradigm as a means for commencing a discussion/analysis of a particular kata. When it comes to naihanchi, the truth is that we will probably never know what Itosu's versions looked like. All we can do is collect the various versions from today, analyse them and compare them. Hopefully such an analysis can give us some perspective of the "ancestral bag of options" - and give us further insight into the applications and potential of this fascinating series of kata. In some cases, it might even give us pause to consider alternatives for certain movements. For these reasons, I must reluctantly conclude that Shimabukuro's naihanchi shodan is unlikely to bear any real resemblance to the kata as practised by Itosu. However it does provide an interesting combination of methods from different schools, all in a very attractive and effective package and demonstrated in an exceptional and inspiring performance. Accordingly, in the words of my friend Ryan Parker, Shimabukuro's kata is probably more "archetypal" than it is "ancestral". 1. 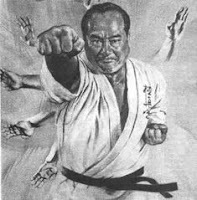 One of the perennial mysteries surrounding both Funakoshi's and Shimabukuro's naihanchi is where they got the haiwan nagashi uke - a technique that does not seem to occur in any other lineage of suidi karate. 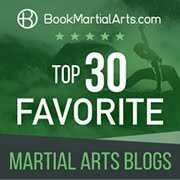 I have always thought it likely that it was Anko Azato who taught Funakoshi this technique, especially as very little is known about Azato's karate (as opposed to Itosu's). "The primary stance in this series of kata is kiba dachi, which emphasizes the strengthening of the legs and hips. A distinct characteristic of the kata is the technique where the circular movement of the arms protects the head in a block, while simultaneously setting up the opening for the uraken." 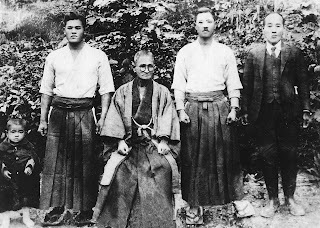 The seibukan connection to Azato might not seem so "stretched" when you consider that Zenryo Shimabukuro was a student of Chotoku Kyan who, I've read, might have trained together with Funakoshi directly under Azato at the Sakiyama Ochogoten dojo. "I visited and studied with many of the older teachers after my father's death but I only learned of history and theory of technique from them. They were happy to give me information because they were close friends of my father." 2. 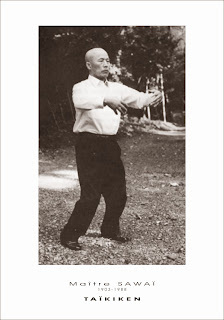 It is worth noting that I perform the "haiwan nagashi" technique in the manner corresponding to how it is done in the Chinese internal and northern "long fist" arts - which is subtly different from how Zenpo Shimabukuro does the technique (ie. straight over, rather than more to the side of, the head and without much rotation of the forearm on its axis). 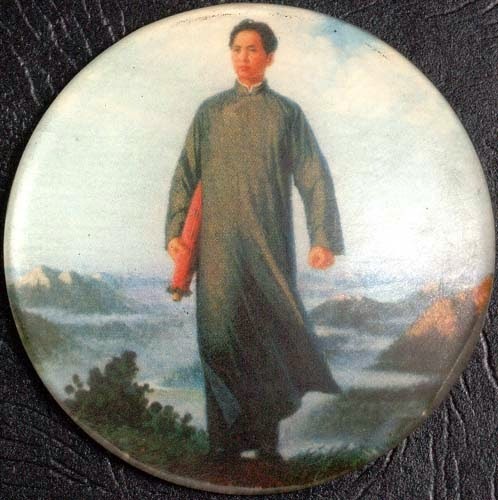 Interestingly, I've only just realised that the "haiwan nagashi" movement appears as "tai xing" in the 12 animals of xingyiquan as well as in more obvious techniques techniques like pao quan etc. 3. 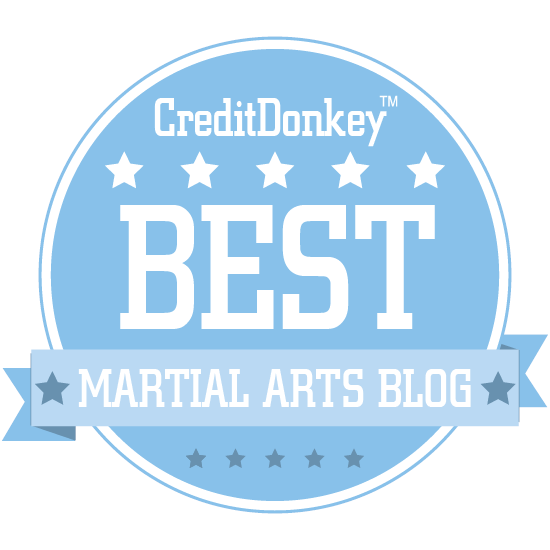 It is true that kata like the goju ryu gekisai and saifa have small sweeps that involve your foot striking your thigh: but these are dedicated unbalancing moves used in very different stances: they don't occur in an open kiba dachi/mabu. Moreover they are not identified as "nami ashi" - the returning wave kick. Accordingly I have no difficulty distinguishing them from the naihanchi movement. 4. 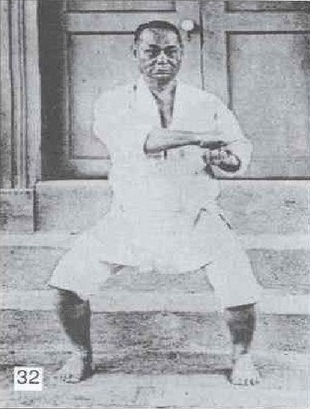 The ashibo kake uke was later converted by Gichin Funakoshi's son, Yoshitaka, into a full gyaku mikazuki geri (reverse crescent kick). We practise this as an option as it involves the same knee movement but adds an additional technique to the mix. Wow, great discussion Dan. Really found it insightful. Like the old pic of me and Ash as well! On ur video Naihanchi 1st 18 sec movement can also be use if someone grab ur left hand, then u move ur left hand rotate to the back and at same time use ur right to help take off the holding hand. Generally good if ur opponent stronger than u. 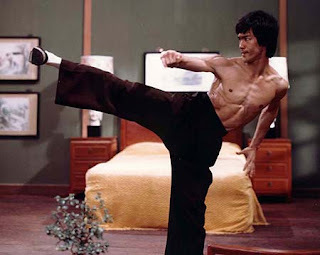 It commonly use on yang style taichi after punching with ur right hand then put the left underneed then sperate the hand.